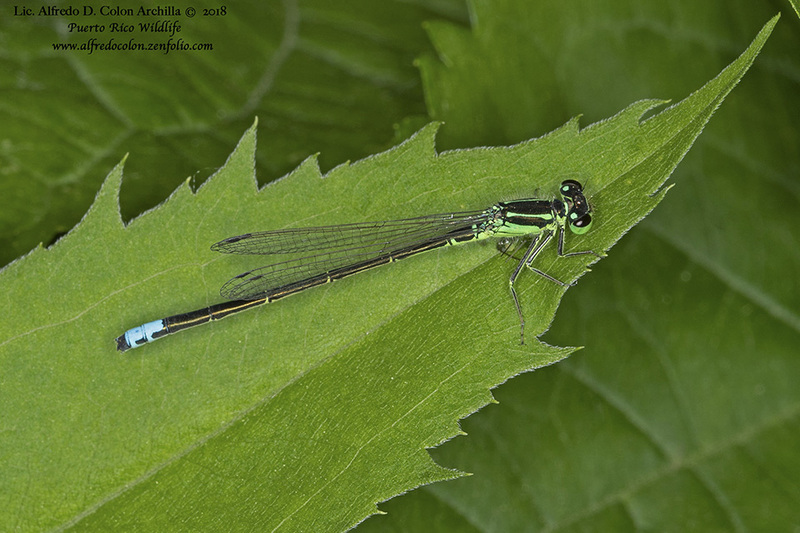 Eastern forktail (Ischnura verticalis) is a small, narrow-winged damselfly. It occurs east of the Rocky Mountains from Quebec and Georgia in the east to Manitoba and New Mexico in the west. It is very common in the northeast and Midwest, present but uncommon in the southern tier of states. It is abundant in Minnesota, where it has been reported in 81 of the state’s 87 counties. Eastern forktail has three color variations. Adult males are mostly black with green eye spots and pale blue shoulder stripes, sides of the thorax, and tip of the abdomen. Adult females are entirely pale powdery blue with larger blue eyespots and few other noticeable markings. Immature females are black with orange markings. Eastern forktail may be the most common damselfly in our area, as it is reported to be in and around Chicago. This entry was posted in Insects and tagged eastern forktail, Ischnura verticalis on April 8, 2019 by John Valo. 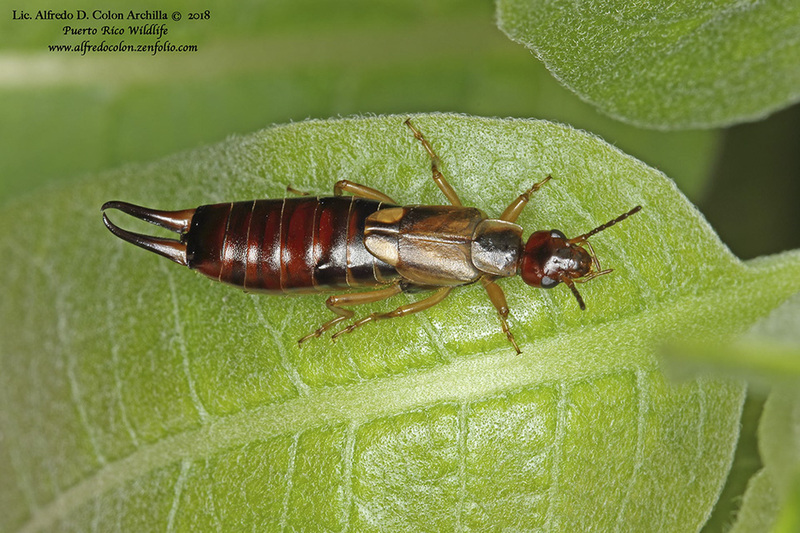 European earwig (Forficula auricularia) is native to Europe, western Asia, and North Africa. It was introduced into North America in 1907 or earlier and spread quickly, hitchhiking in vehicles and in shipments from other countries. It is now found across the continent and is the most abundant earwig in North America. Adults are omnivorous, feeding on live and dead small insects and on living and dead plant matter. A common myth is that the name earwig refers to the insects crawling into the ears of sleeping human beings. In fact, it refers to the shape on the unfolded, semicircular hindwing, which vaguely resembles a human ear. Earwigs are easily identified by the elongated body and long, forcep-like appendages at the end of the body. European earwig is distinguished by the brown coloration; antennae with 14 segments; and the second segment of the end part of each leg with a lobe at the end that is expanded both to the side and forward under the third segment. This entry was posted in Insects and tagged European earwig, Forficula auricularia on January 8, 2019 by John Valo. Common green lacewing (Chrysoperla carnea) is a very common, medium-sized, net-winged insect. It occurs in Europe, Asia, North Africa, and North and South America. True to its common name, it is the most common green lacewing (family Chrysopidae). Adults have a long, slender, pale green body, long antennae, gold or copper-colored eyes, and transparent wings with a network of pale green veins. They are not predacious, feeding on flower nectar and pollen and on aphid honeydew. They are active at night and are attracted to lights. They may emit an unpleasant odor when handled. Larvae are alligator-like in appearance. They have long, sickle-shaped mandibles and well-developed legs which allow them to move quickly. 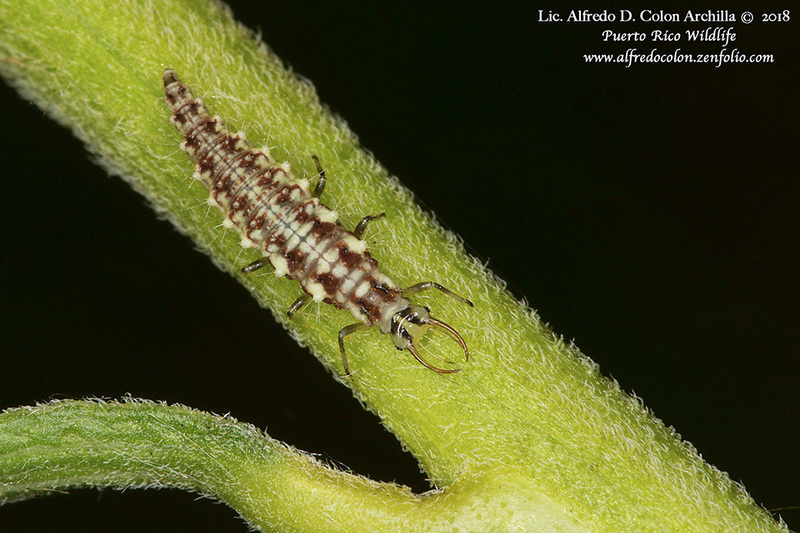 They are predacious, feeding mostly on aphids but also on many other insect adults, larvae, and eggs. This entry was posted in Insects and tagged Chrysoperla carnea, common green lacewing on January 1, 2019 by John Valo. Band-winged crane fly (Epiphragma fasciapenne) is a common, easily identified, moderate-sized crane fly. It occurs in the eastern United States and adjacent Canadian provinces east of the Great Plains. Eastern Minnesota is at the western edge of its range. It is found in floodplain woodlands and wooded areas adjacent to swamps. Like all crane flies, the body is long and slim, the wings are long and narrow, and the legs are very long, very thin, and very fragile. The thorax has a distinct, V-shaped groove on top. The lower jaws each have a very long, antenna-like extension. 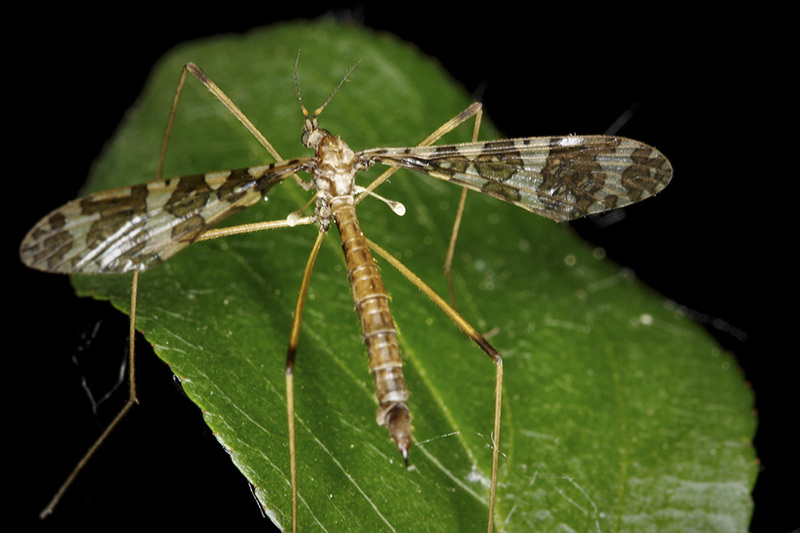 Band-winged crane fly is distinguished by the distinctive wing pattern with four bands of bordered brown spots, and by a dark brown band at the very tip of the third leg segment. This entry was posted in Insects and tagged band-winged crane fly, Epiphragma fasciapenne on November 6, 2018 by John Valo. Eumerus is a genus of small hoverflies in the family Syrphidae. With 281 known species, it is one of the largest genera of flies. It is found throughout the Palearctic realm, which includes Europe, Asia north of the Himalayas, North Africa, and the northern and central parts of the Arabian Peninsula. Several Eumerus species have been introduced into North and South America. 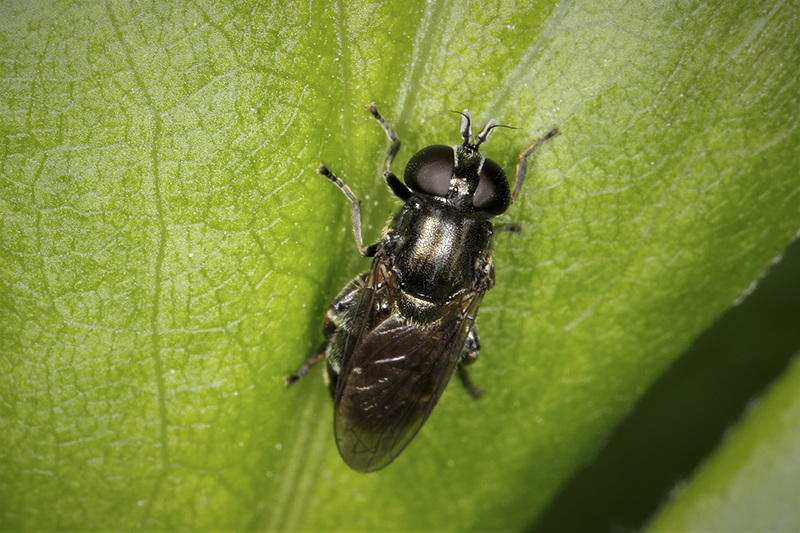 Three of these are known to occur in the United States: lesser bulb fly (Eumerus funeralis), narcissus bulb fly (Eumerus narcissi), and onion bulb fly (Eumerus strigatus). Collectively, they are known as lesser bulb flies. Adult lesser bulb flies are black tinged with bronze. They have pale longitudinal stripes on the thorax and silvery-white stripes on the abdomen. The larvae are considered pests. They tunnel into plant bulbs, causing the bulbs to rot. The bulb either dies or produces stunted growth in the following growing season. In some areas, up to 25% of narcissus bulbs are infected. This entry was posted in Insects and tagged Eumerus spp., lesser bulb fly on October 24, 2018 by John Valo. There are more than 850 species of nomad bee (Nomada sp.) worldwide, more than 280 species in North America. 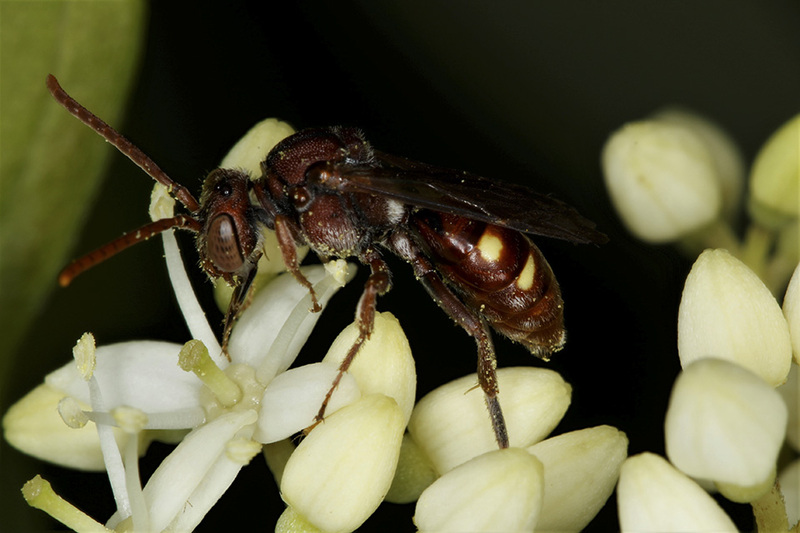 Like other cuckoo bees (subfamily Nomadinae), nomad bees do not construct nests, but lay their eggs in the nests of ground-nesting bees. One to four eggs are laid in the cell wall of the host nest. The larvae have large, outward-facing, scissor-like mandibles. The first larva to emerge destroys all the other eggs, both those of the host and those of its own siblings. It consumes the pollen provisioned by its host, and emerges as an adult the same time as the host adults emerge. Nomad bees are usually black, black and red, or entirely red, with yellow, white, and/or red markings. Many species have red legs. The genus Nomada includes the only bees in North America that are entirely red. They have short, thin, and inconspicuous hairs on the body and no pollen-collecting hairs (scopa) on the hind legs. They look more like wasps than a bees. This entry was posted in Insects and tagged nomad bee, Nomada sp. on September 3, 2018 by John Valo. Iowa skipper (Atrytone arogos iowa) is a species of special concern in Minnesota. Its populations are restricted to undisturbed tallgrass and shortgrass prairies in the Great Plains. Massive habitat destruction and excessively frequent prescribed burning on managed prairies are major threats to the subspecies survival. It is declining in the northern parts of its range. It is no longer found in 200 western counties it was once known from. It is estimated that there are over 100 remaining populations, but those are small and scattered. It is considered uncommon to rare wherever it occurs. In Minnesota, it is found mostly in the southwest quarter of the state. 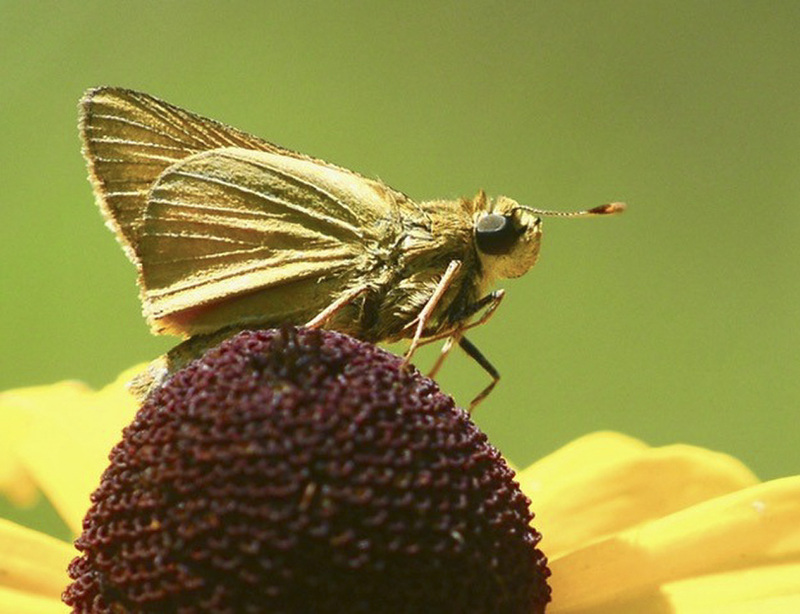 Iowa skipper is a small to medium-sized grass skipper. The wings are yellowish-orange with a broad, dark border. The female has a thin black streak in the center of the forewing, but otherwise the wings are unmarked. When at rest, the forewings are held at a 45° angle and the hindwiings are held horizontal, a configuration that resembles an F-15 Eagle fighter jet. Iowa skipper is similar in appearance to the Delaware skipper (Anatrytone logan), which is much more common. Iowa skipper is distinguished by the lack of any black veining on the upperside of the wings; lack of a black cell end bar on the forewing; wing undersides not as bright; and the hindwing fringe that is usually white, not tan or orange. This entry was posted in Insects and tagged Atrytone arogos iowa, Iowa skipper on July 27, 2018 by John Valo. 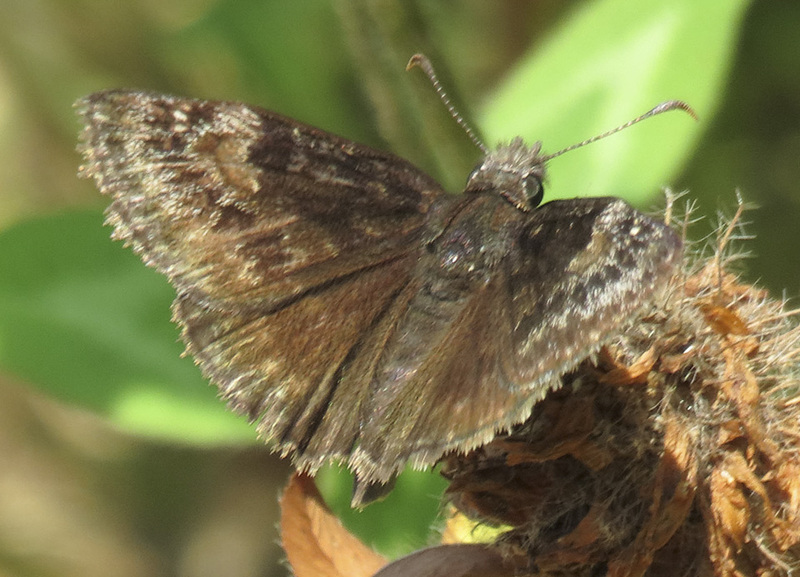 Wild indigo duskywing (Erynnis baptisiae) is a medium-sized spread-wing skipper. It is widespread, abundant, and increasing in the east and the Midwest, but rare in Minnesota. Wild indigo duskywing was originally a species of open woodlands and shrubby prairies. The larvae fed on mostly on horseflyweed but also blue wild indigo and sundial lupine. With the decline of those species due to habitat loss, the skipper adapted to the introduced, locally abundant species crown vetch. Today, its range is rapidly expanding and its numbers are increasing wherever crown vetch has been widely planted. Wild indigo duskywing has dark brown wings; a pale spot at the end of the forewing cell; and four translucent white spots at the leading edge near the tip of the forewing. Along with columbine duskywing and Perseus duskywing, it is part of the “Persius species complex”. They are very similar in appearance and difficult or impossible to distinguish in the field. Columbine duskywing is smaller, lighter, and has shorter wings. Perseus duskywing has not been recorded in Minnesota. This entry was posted in Insects and tagged Erynnis baptisiae, wild indigo duskywing on July 26, 2018 by John Valo. Cocklebur weevil (Rhodobaenus quinquepunctatus) is a medium-sized snout beetle. It is widespread in the eastern half of the United States. Adults eat the stalks and leaves of cocklebur, ragweed, thistle, ironweed, Joe Pye weed, sunflower, marsh elder, and rosinweed. Larvae bore into the stems and roots of the same species. It is easily controlled and does not occur in numbers high enough to become an agricultural pest. Snout beetles are identified by their very long snout. Cocklebur weevil is identified by the reddish-orange body; the oval-shaped black spot in the middle of the thorax; and ten black spots on the wing covers that usually merge to some extent with neighboring spots, especially toward the rear. 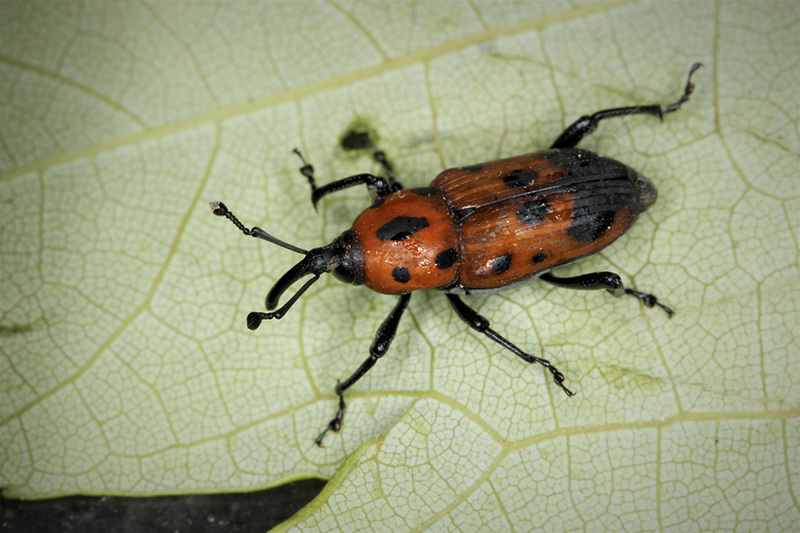 This entry was posted in Insects and tagged cocklebur weevil, Rhodobaenus quinquepunctatus on July 23, 2018 by John Valo. Pandorus sphinx (Eumorpha pandorus) is a very large, dramatically patterned, sphinx moth. It is common and widespread in eastern United States. Adults fly at dusk from May to September. They have a wingspan of 3¼″ to 4½″, and a pale green background with a complex pattern of dark olive-green markings. Humans are more likely to encounter caterpillars than adults. Known as hornworms, the caterpillars are found on grape and Virginia creeper in Minnesota, and also on peppervine elsewhere. They are very large, up to 3½″ long, and consume copious amounts of foliage. They can completely defoliate young grape vines, ultimately killing them. Older vines can withstand the damage. Pandorus sphinx is similar in appearance to Achemon sphinx (Eumorpha achemon). The latter species is smaller and less common, and the adults are brown, not green. 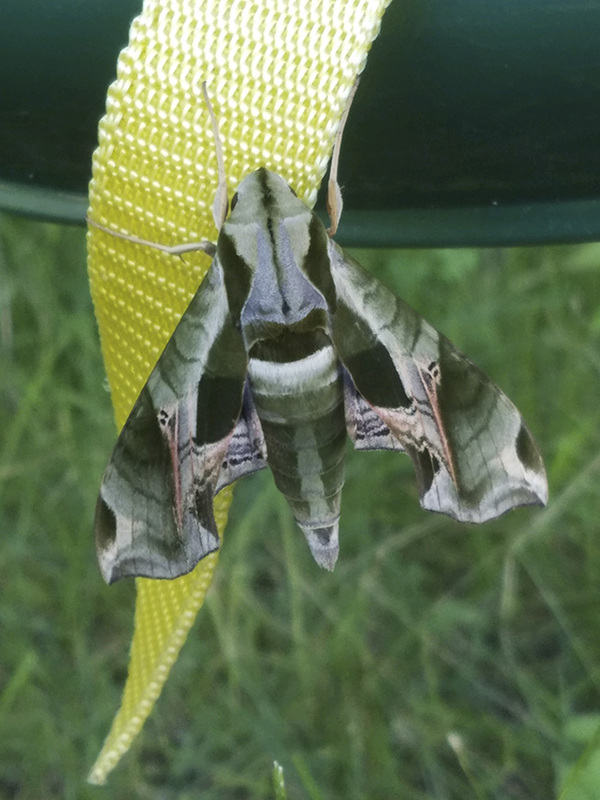 This entry was posted in Insects and tagged Eumorpha pandorus, pandorus sphinx on July 22, 2018 by John Valo.